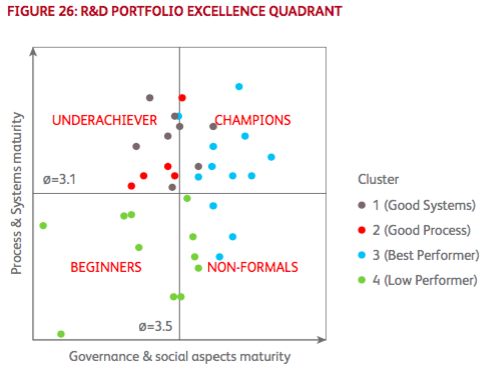 The gained knowledge, key factors and identified user clusters can be consolidated to a general result portfolio, the R&D Portfolio Excellence Quadrant. The vertical axis shows the average value of process and system maturity, the horizontal axis the average maturity of governance and social aspects (organizational factor). The center point lies on the respective average value of the whole distribution, with the points being the positions of participating companies, differentiated by color between the four behavioral clusters. CHAMPIONS show above-average strengths in both core fields of portfolio management. UNDERACHIEVERS are best performers in terms of processes, but also have distinct weaknesses in governance and are therefore not yet champions, as they do not know how to realize their potential. Companies in the NON-FORMAL quadrant show strengths in governance, but are lacking processes and accompanying systems. Companies in the BEGINNER quadrant are either positioned negatively towards the whole topic for a variety of reasons, or have just begun with first implementations. Based on a company’s position within the quadrant, along with its belonging to a cluster, a focused and efficient optimization of product development control can occur. Do you have questions or want to talk to an expert? Contact us! The long-term success of an industrial company is largely dependent on the life cycle of its products and the innovative capacities to further develop these products.